Another game day so soon? Yep, they come thick and fast in British Champs. 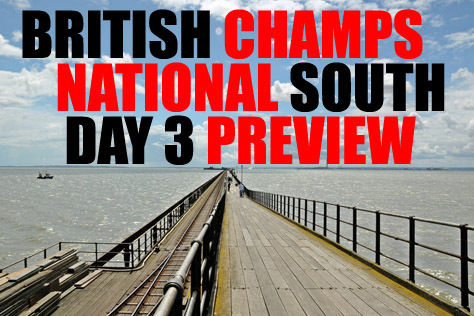 Day Three of the National South division takes place this Saturday (21st March) near Southend-on-Sea. Doors are at 1pm with first whistle at 1.30. Tickets are £10 in advance (£8 students) from the link at the bottom of this preview or £12 on the door. This is a pretty small capacity venue – roughly half that of the recent sold out East London game day – so we very much recommend buying online as soon as possible. There may well be no tickets left on the door. The venue is Clements Hall Leisure Centre in Hawskwell, Essex. This is about ten minutes walk from Hockley train station, which is four stops before Southend Victoria on the line from Liverpool Street (not to be confused with the train line from Fenchurch Street that goes to Southend via a different route). Although the journey from London to Hockley is only 45-50 minutes, getting to London from Sussex will be a bit of a mission on Saturday, as those delightful words “replacement bus to Three Bridges” have been dusted off for the whole weekend. We recommend allowing a good two hours to get to Liverpool Street, including a bit of faffing around on the tube. If this sounds like a bit of a mission, you might be interested to know that the Rockers have a few spaces for fans on their team bus. These will cost in the region of £12 return, leaving Brighton around 11am and returning in the evening after a bit of after partying. Get in touch with the Rockers via Facebook/email asap if you’re interested. We normally recommend a few pubs, but this is actually the Rockers’ first UK away trip to somewhere we haven’t previously done drinking in. Given that Hockley is a fair way inland from Southend itself, allow extra time if you want to hit the seafront, attractions and/or town centre bars before the games. The after party venue is a bowling alley very close to Hockley station, and there are a fair few pubs close to the leisure centre, most of which receive moderate to good write-ups online. The White Hart on Southend Road is the closest, and there is of course a bar at the venue. Now for our ever exciting rundown on how the games might play out using the predictometer at Flattrackstats. A relentless tirade of numbers mostly beloved of game day announcers who have run out of anything else to say! Firstly, hosts Seaside Sirens (ranked 22nd in UKRDA on 584.8 points) are up against Royal Windsor (10th, 645.5). FTS calls this one as 84% chance of an away win, with a predicted 51:31 differential in Windsor’s favour equating to something like a 255-155 RWRG win. Using the Euro rankings rather than UKRDA works out even more heavily in Windsor’s favour, with the Berkshire side ranked 19th on 671.2 points given a 92% chance of beating their Essex hosts (55th, 593.8). Predicted differential here of 35:18 works out as a typical derby scoreline in the region of 315-162. Moving on to the Brighton Rockers v Bristol game, as ever with a neutral host venue we have to split the difference between the home and away predictions. (Memo to FTS: please introduce a neutral option!) Brighton are 11th in UKRDA on 640.0 points, whilst the division’s lowest ranked side Bristol sit in 26th on 578.0. The Rockers have roughly 90% chance of the win, with a differential of 29:16 mathsing out to something like 232-128 on the board. Switching to the Euro rankings, things are a fair bit closer. Brighton place 27th (641.0 points) and Bristol are 41st (610.9). The predictometer, when tweaked for neutral, calls it at 75% chance of a Rockers victory with a differential in the region of 62:46 suggesting a Sussex victory in the order of 186-138. That’s super close in derby terms, and given the margin of error of these computerised predictions, pretty much anything could happen on the day. In terms of the divisional table, LRR sit on the top with two wins and a +281 points difference. They’re sitting out this game day, so the other unbeaten teams (Windsor and Brighton) know what is required of them in their second games of the season. Windsor need to beat Sirens by 160+ to leapfrog LRR on points, whilst Brighton need to best Brizzle by a whopping 204 or more to do likewise. For Bristol and Seaside, both sides will be looking for their first win, which (given Portsmouth’s absence today) would put clear space between themselves and the bottom slot. After a quite a heavy defeat to LRR on Game Day 1, you put in a strong performance against Brighton on Day 2, despite penalty foul outs reducing you to six players. Anything from that Brighton game that you’ll be building on for the rest of your British Champs campaign? One thing we have been working on – which won’t be a surprise! – is penalties! We’ve had the chance to see what worked and what didn’t and get ready to put it into play for Saturday. Due to a few fixtures having been swapped over, SSRG are in the unusual position of playing in three Game Days (1-3) in a row! Are there any advantages or disadvantages to playing so many Champs games in succession? I think it gives us an opportunity to review what works and what doesn’t work for us and to put it into play quickly. There’s no chance to take our foot off the gas and become complacent because we’re always in game mode, which is fun. In an ideal world most derby teams would give anything to play every week, like most sports teams, so to play once a month has been a great opportunity. Your opponents this Saturday are Royal Windsor. We believe you’ve played them once before, more than three years ago (RWRG winning that 134-77). How are you expecting this meeting to go? We played them for an exhibition bout for Sky News three years ago and our squad was very varied in that game. It was a 40 minute game and a cherry popper for myself. 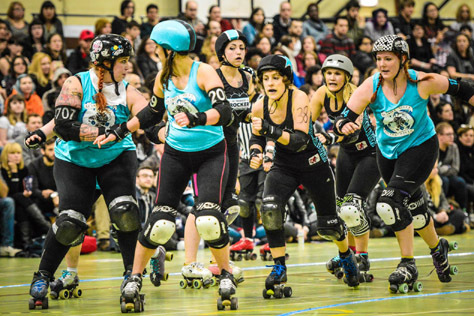 Royal Windsor Rollergirls are a great team to watch and their drive to grow and continuously develop their game is a great inspiration. We’re really looking forward to playing them on the track and anticipate a great game. Locking down their jammers, who push hard to find the smallest gaps will be our main aim. The day’s other game sees Brighton take on Bristol. What should people look out for in that one? Watching Bristol play LRR at the last game was a great opportunity to see how they play as a team. We played Bristol two years ago and they appear to have grown in strength and their walls are solid. Brighton have agile fast jammers who do not give up looking for the gap to take. Finally, Sirens are hosting the action on the 21st. What can you tell us about the Clements Hall venue, the after party and the Southend area in general? This is very exciting for us as it’s at our new venue, Clements Hall! We have previously bouted on a very slippery wooden sports hall floor and this will be our first game on a sticky traditional UK sports court. Though this is also our Sunday scrimmage venue so we’re used to it. It has a great roll but hard wheels are advised. Our Force Ten Gail recommends 93s. We have tiered seating, so will be giving our fans a different view of the track for the first time ever, but it only holds 170 people so get your tickets fast! We will have merchandise on sale for the teams and also Resolute Framing, an independent business offering high quality, bespoke framing and framed prints, limited edition artworks, photographs, collectables and more. We have a cake stall selling all kinds of treats and the proceeds will be going towards our local branch of Cats Protection League, a charity which is close to many of our hearts. And finally, we have a fully licensed bar, which will be situated in the hall, so you won’t need to miss a second while getting your refreshments! We are also having our after party at a different venue, nearer to our sports hall, at CJs Bowling Alley. Anyone who came along to the recent Roller Derby Sevens tournament will have enjoyed the after party there, and there’s plenty of parking for the visiting teams’ coaches and cars. We have bowling alleys booked, and there’s food and drink on offer. And finally, Southend itself. We are home to the world’s longest pleasure pier and Adventure Island. Come and ride the roller coasters, eat some candy floss and skim some stones while eating hot donuts! Hi there. So you’re 20% of the way through your British Champs National South campaign now. Was it good to get that opening win under your belts last month against the Seaside Sirens? I think it would have been easy for us to go in with high expectations based on the result last time the Rockers and the Sirens met, but we definitely appreciated that both teams have changed a lot since then, and no result is ever a given. We were also going in without a couple of key players who would normally be on our A-team roster, so we couldn’t be sure how much of a difference that would make. We definitely had a half-time turn around. We’d figured out what was working for us, they lost a couple of players to penalties, and we just focused on being a strong unit and really tiring out those remaining players, which allowed us to pull ahead at the end. It’s a great feeling to have a win under our belt at the first stage, and hopefully we can carry that success through the rest of the competition. 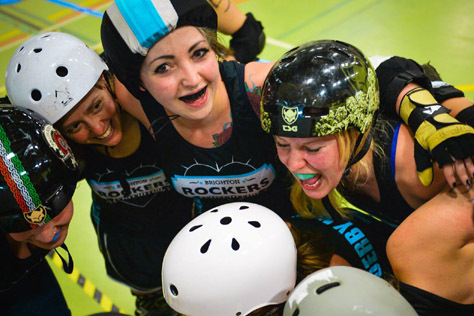 Your opponents on Saturday are Bristol Roller Derby. In a way this is a “best of three” decider, with one win to Bristol (251-175 in London in 2013) and one win to Brighton (277–209 at Haywards Heath last September) in previous meetings – we make it 460-452 to Bristol on points at present. Presumably you know their roster fairly well now? Moving onto the Brighton squad, can we expect one or two of the Rockers who were missing against Sirens to return to action against Bristol? Care to predict the result? We never predict the result but do predict a party bus all the way home whatever the outcome. British Champs is giving us a great chance to vary our roster. Although Saturday’s side will be similar to the team that played the Sirens, we like to mix it up a bit. The day’s other games sees Royal Windsor take on the Seaside Sirens. Any thoughts about how that one will go? That game will be brilliant. Sirens were really tough to play in our first Champs game, but Windsor are such an experienced team. I think this game will be less about individual players, and more about which side has the best teamwork. Finally, with games against Windsor, Portsmouth and LRR coming up in the next few months, what are your views on the National South division as a whole? Bristol made their British Champs debut last month against divisional leaders LRR. Did that game go the way you expected? We were really pleased with our opening game to Champs. Being seeded the lowest in the group and facing leaders LRR we anticipated a really hard fight and we weren’t disappointed. 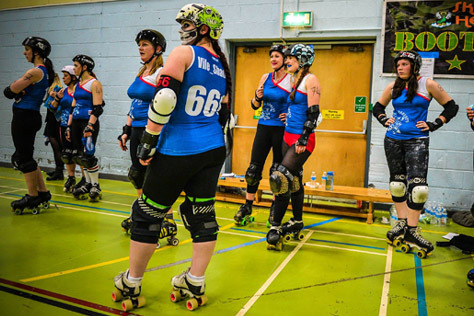 LRR’s blockers were very strong with some bruising offensive moves and their jammers were nippy and agile. It’s what we expected and what we’d prepared for. I think we probably took LRR a little by surprise with the strength of our walls and the power and determination of the Bristol jammers. A huge positive for us is that, despite losing the game, we kept the points differential a lot closer than anticipated, leaving us nestled comfortably mid-table. You’re facing the Brighton Rockers on Saturday in Southend. In your two previous meetings with the Rockers, it’s one win apiece, so in a way this is a “best of three decider”. Which Bristol players or tactics do you think are going to play a key role in this game? Yes, we are really looking forward to ‘The Decider’ against the Rockers. Our last fixture in 2014 was fantastic and we really hope to replicate the energy and athleticism of that day. We watched part of the Rockers’ game against Seaside last month so we’re pretty familiar with their style of play. We have a few tactics up our sleeve but you’ll have to wait until game day to find out what those are! Having met the Brighton on track twice in the last two years, you presumably know their squad fairly well. Who are you looking out for? Care to predict the result? I think the team has changed a bit since we last met, but the Rockers have a strong and dynamic squad who I’m sure will be working hard to make life difficult for us on Saturday. Dr Whooligan had a good game against Seaside Sirens, as did Hairy Fairy and Swann, but we will be looking at the team as a whole, not concerning ourselves about individual performances. I predict that this game is certainly going to be one to watch. After all, this isn’t just about positions on the British Champs table. This is the accumulation of three years of history between Brighton and Bristol. This is ‘The Decider’! The day’s other game sees Royal Windsor take on the Seaside Sirens. Any thoughts about how that one will go? Finally, the game day after this one (Day Four on May 9th) you’re hosting in Bristol. Are plans in hand for that event? And what are BRD’s hopes and ambitions for the remainder of the 2015 British Champs season? Plans are well underway for when Bristol host the tournament on May 9th. The event coincides with Bristol Roller Derby’s Fifth Birthday, so we will be celebrating in style and hope lots of skaters and supporters can stay and enjoy the after party with us. There will be cake and fizzy stuff, and no Bristol Roller Derby after party is complete without some German Leg Wrestling. Our ambition for the British Champs season is probably the same as everyone else’s – to finish as high as possible up the table! Being seeded lowest in the group doesn’t stop us from aiming high. We have a very strong team who all want to play great derby against other great teams. But we’re a competitive bunch, so ultimately our aim is to win! This entry was tagged Brighton Rockers, Bristol Roller Derby, British Champs, roller derby, rollerskating, Royal Windsor Rollergirls, Seaside Sirens, sport, UKRDA, women's sport.